Matthew Simmons has pointed out variously and correctly (such as in The End of Suburbia and Twilight in the Desert) that traffic congestion is enemy number one for wasted liquid fuel. Traffic congestion is public enemy numbers 1 through 8 on passenger car fuel efficiency. And so we can have all of these Priuses and hybrids, don't get me wrong they are great. I drive a fabulous new Diesel Mercedes and I get, on the open road, as long as there is no traffic, I can get almost 50 miles to the gallon. But when I am in stop-and-go traffic I get between 5-11 miles to the gallon. You know, I think I've lived through that Jam before. 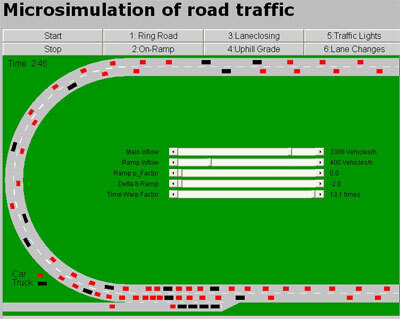 I wanted to mention how easy it really is to set up this kind of simulation. I used to set formulate the relations in the context of a related application and I found out it doesn't take much to get to the meta-stable behavior.